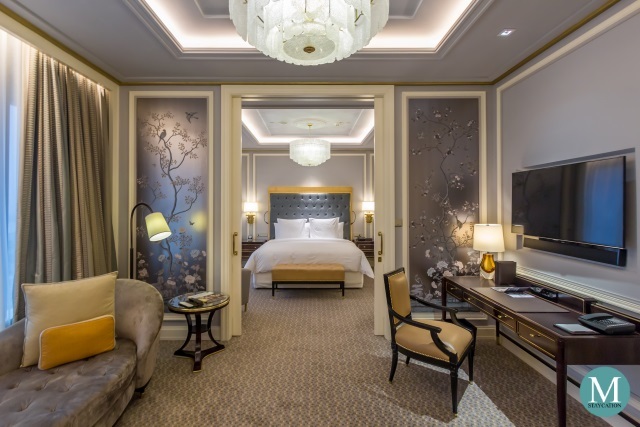 Shang Palace is the premier Chinese restaurant of Shangri-La Hotel Suzhou which specializes in traditional Huaiyang and Cantonese cuisines. 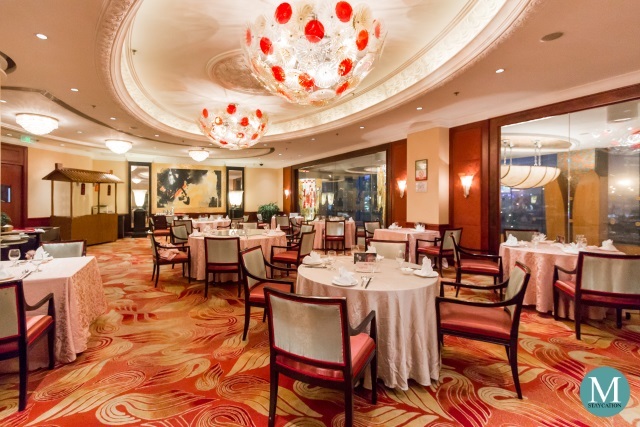 Shang Palace is also a popular dining destination for classic Suzhounese and Shanghainese dishes. The restaurant has a spacious main dining area and seven private dining rooms which are perfect for casual dining with friends, family celebrations of official business functions. The menu features appetizers, cold dishes, dumplings, noodles and soups, meat and seafood dishes, vegetarian dishes and desserts. 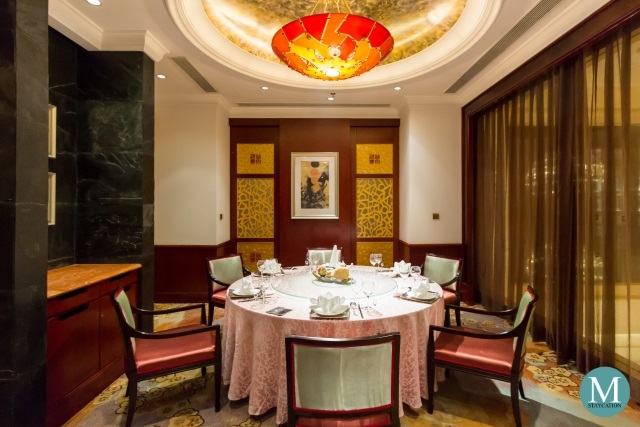 One of the strengths of Shangri-La Hotels & Resorts are its specialty Chinese restaurants, and anywhere you go around the world, a Shangri-La Hotel is the best place to experience superior quality Chinese dining. 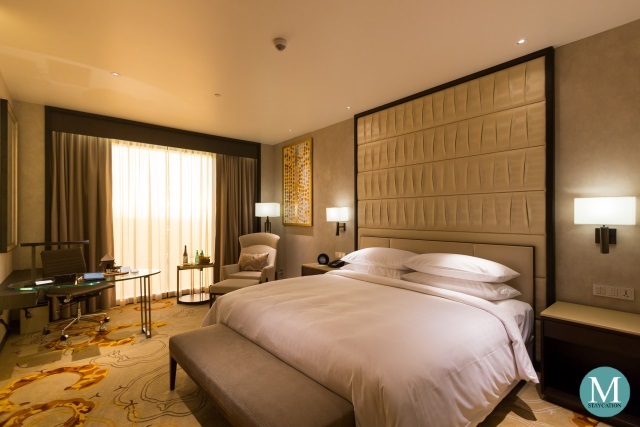 This is very well true at Shangri-La Hotel Suzhou. 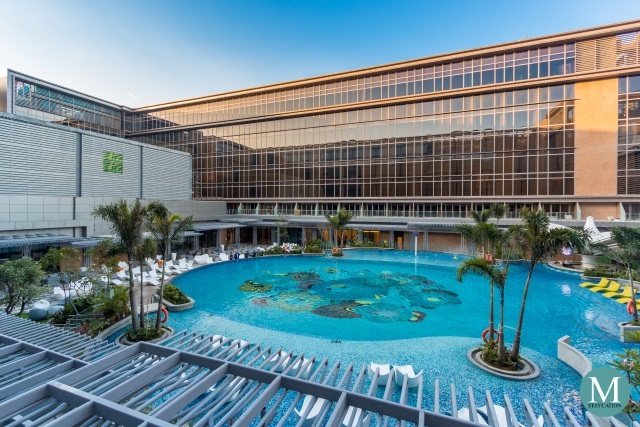 During my stay at the hotel, I did not go far anymore and chose to dine at the hotel's Shang Palace. I started my meal with two cold dishes. 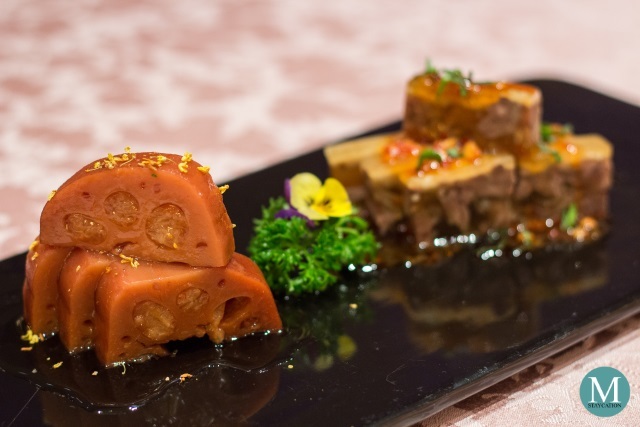 The first one was the Sweetened Lotus Root with Osmanthus Flower (桂花糯米藕), a lightly sweet appetizer consisting of lotus root stuffed with glutinous rice. The other one was the Stewed Pig Cheeks Luhe Style (六合猪头肉) which was cooked long enough that the fats already turned to a jelly-like texture. 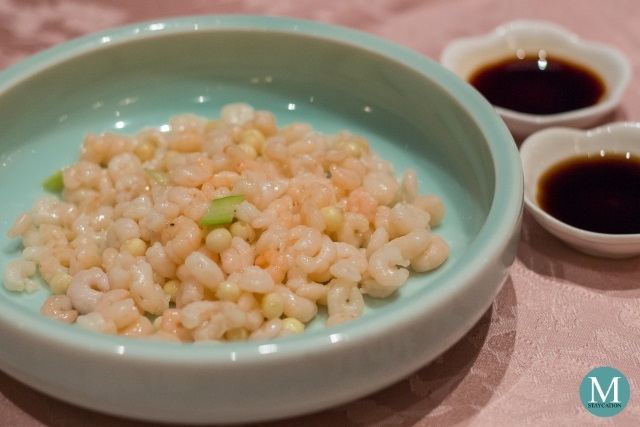 A very popular dish in Suzhou and a must-try at Shang Palace is the Stir-fried Tai Lake Shrimp with Euryale Seeds (鸡头米太湖虾仁). It is a very simple dish that highlights the natural taste of the shrimps. Soy sauce and Chinese vinegar are served on the side to add flavor to the dish. 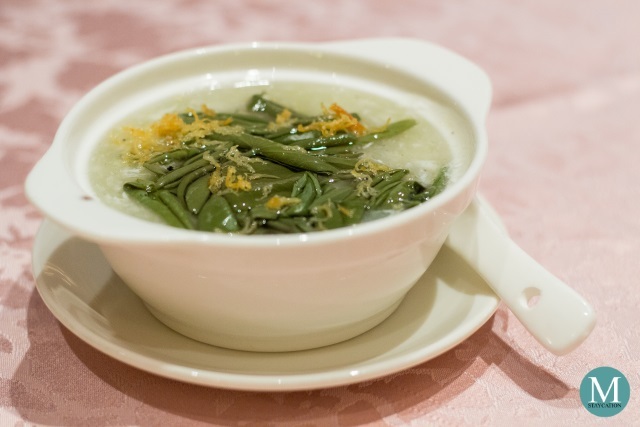 Another must-try dish from the menu is the Braised Silver Fish with Water Shield (太湖莼菜银鱼羹) which is a soup dish made with two very local ingredients. Both the silver fish and the water shield leaves were sourced from the Tai Lake. The most unique ingredient of this dish is the water shield leaves which have a gelatinous texture. 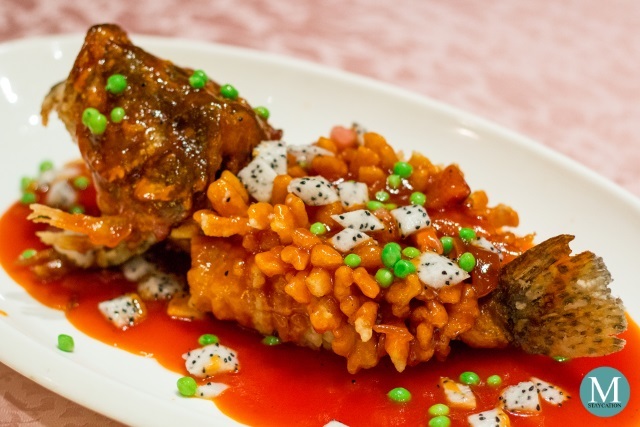 One of the most iconic dishes in Huaiyang cuisine is the Deep-fried Mandarin Fish with Sweet and Sour Sauce (姑苏松鼠桂花鱼) which Shang Palace beautifully serves in its traditional squirrel fish shape. Great knife carving skills are needed to achieve this presentation. The meat has an interesting combination of textures, with a crunchy outer layer and tender in the inside. 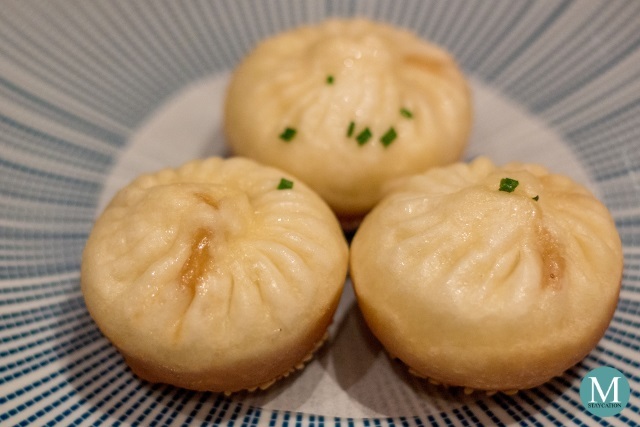 More popular as a breakfast dish, the Pan-fried Pork Buns (香麻生煎包), or sheng jian bao as they are locally called, is also a must-try here at Shang Palace. These buns have a thicker and fluffier skin and has a crunchy bottom. The buns are filled with minced pork and the fats turn into a soup when cooked. The pan-friend pork buns are popular in Shanghai and in many cities across the Jiangsu Province. 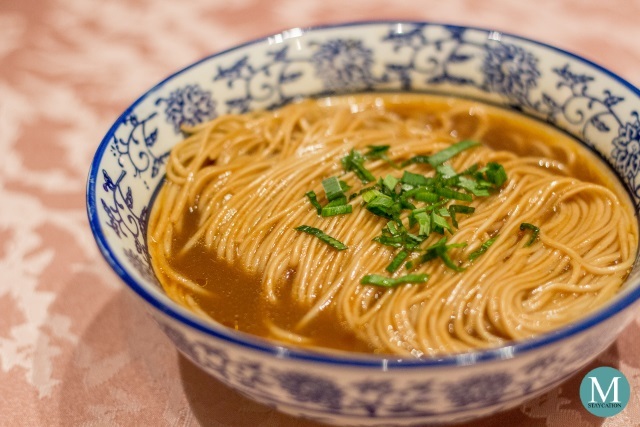 Another popular breakfast dish in Suzhou is the Local Ao Zao Noodles (苏式红汤奥灶面). The dish originated from the city of Kunshan which lies between Shanghai and Suzhou, but it has become popular to tourists visiting Suzhou. What's special about this noodle soup dish is its broth which is a mixture of fish broth and duck broth. And of course, no Chinese meal is complete without fresh fruits. 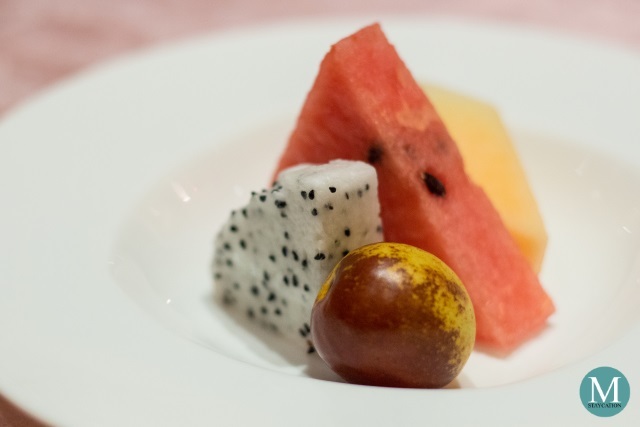 It was the beginning of winter when I visited Suzhou and I was quite surprised that tropical fruits like watermelon and dragonfruit were available in China, and they were very sweet and juicy. 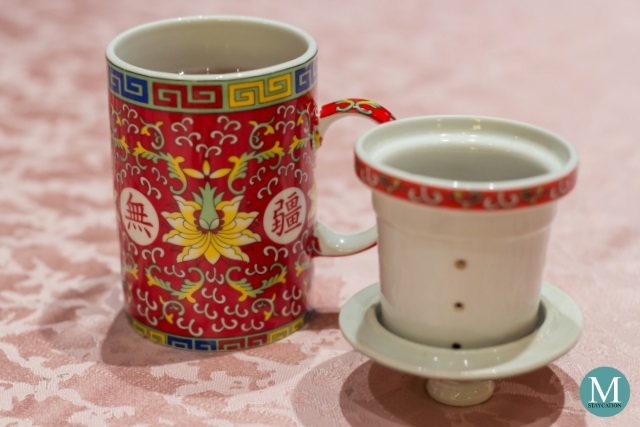 Throughout the evening, I was also drinking Pu'er Tea which bitter and earthy flavor complements the sweet flavors of Huaiyang cuisine.